The queuing is applied on packets leaving the router through a real interface (i.e., the queues are applied on the outgoing interface, regarding the traffic flow), or any of the 3 additional virtual interfaces (global-in, global-out, global-total). The QoS is performed by means of dropping packets. In case of TCP protocol, the dropped packets will be resent on a slower rate, so there is no need to worry that with shaping we lose some TCP information. queuing discipline (qdisc) - an algorithm that holds and maintains a queue of packets. It accumulates the packets and decides the order of the outgoing packets (it means that queuing discipline can reorder packets). Qdisc also decides which packets to drop if there is no space for them. Before sending data over an interface, it is processed with a queuing discipline. There can be only one queueing discipline per interface, which, by default, is set under /queue interface for each physical interface (there is no default queuing discipline for virtual interfaces). Once we add a first queue (in /queue tree or /queue simple) to a physical interface, the interface default queue is replaced by HTB hierarchy with that queue, but the one defined in /queue interface for that particular interface, is no more active. HTB (Hierarchical Token Bucket) is a classful queuing discipline that is useful for applying different handling for different kinds of traffic. The queues you add in /queue simple and /queue tree are attached to the main Hierarchical Token Bucket (HTB). For example, you can set a maximum data rate for a workgroup and then distribute that amount of traffic between the members of that workgroup. filter - a procedure that classifies packets. The filters are responsible for classifying packets so that they are put in the corresponding qdiscs. All filters are applied at the HTB root and classify packets directly into the qdiscs, without traversing the HTB tree. If a packet is not classified into any of the qdiscs, it is sent out to the interface directly, traversing the HTB, so no HTB rules are applied to those packets (it would mean effective higher priority than of any packet flow managed by HTB). level - position of a class in the hierarchy. class - algorithm for limiting traffic flow to a certain rate. It does not store any packets (this function can only be performed by a queue). A class may contain either one or more subclasses (inner class), or one and only one qdisc (leaf class). inner class - a class that has one or more child class attached to it. As inner classes do not store any packets, qdiscs can not be attached to them (so their qdisc and filter settings are ignored, although may be still shown in RouterOS configuration), so they only do traffic shaping. Priority setting is ignored as well. leaf class - a class that has a parent but does not have any child classes. 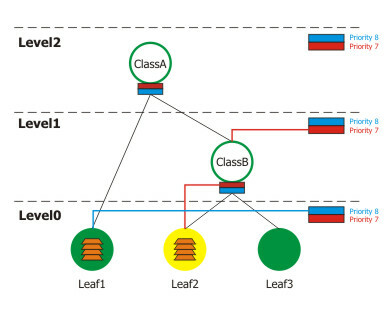 Leaf classes are always located at level 0 of the hierarchy. Each leaf class has one and only one qdisc attached to it, with a certain priority. self feed - an exit (out of the HTB tree, to the interface) for the packets from all the classes active on its level of the hierarchy. There is one self feed per level, each consisting of 8 self slots that represent priorities. self slot - an element of a self feed that corresponds to each particular priority. There is one self slot per priority per level. All classes, active at the same level, having the same priority are attached to one self slot that they are using to send packets out through. active class (at a particular level) - a class that is attached to a self slot at the given level. inner feed - similar to a self feed object, which consists of inner self slots, present on each inner class. There is one inner feed per inner class. inner feed slot - similar to self slot. Each inner feed consists of inner slots which represent a priority. Each class has a parent and may have one or more children. 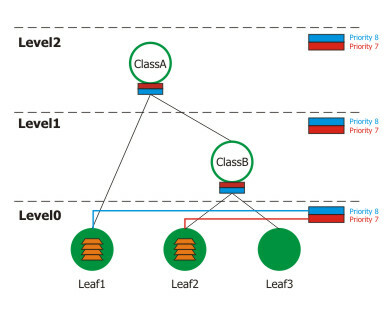 Classes that do not have children, are put at level 0, where queues are maintained, and are called 'leaf classes'. green - a class the actual rate of which is equal or less than limit-at. At this state, the class is attached to self slot at the corresponding priority at its level, and is allowed to satisfy its CIR limitation regardless of what limitations its parents have. For example, if we have a leaf class with limit-at=512000 and its parent has max-limit=limit-at=128000, the class will still get its 512kbps! All CIRs of a particular level are satisfied before all MIRs of the same level and any limitations of higher levels. yellow - a class the actual rate of which is greater than limit-at and equal or less than max-limit (or burst-limit if burst is active). At this state, the class is attached to the inner slot of the corresponding priority of its parent's inner feed, which, in turn, may be attached to either its parent's inner slot of the same priority (in case the parent is also yellow), or to its own level self slot of the same priority (in case the parent is green). Upon the transition to this state, the class 'disconnects' from self feed of its level, and 'connects' to its parent's inner feed. red - a class the actual rate of which exceeds max-limit (or burst-limit if burst is active). This class cannot borrow rate from its parent class. Note: as CIRs are always satisfied before MIRs or other limitations of higher levels are consulted, you should always ensure that the limit-at property of any inner class is equal or greater than the sum of all limit-at parameter of the children of that inner class. As you can see from the picture, leaf-classes that are in the green state will always have a higher effective priority than those that are yellow (and, thus, borrowing their rate from parent classes), because their priority is at a lower level (level 0). 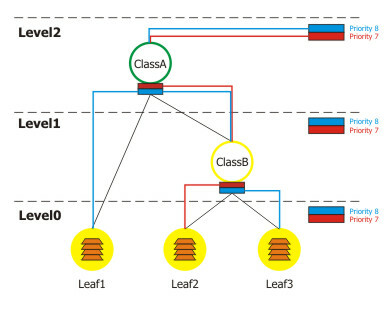 In this picture, Leaf1 will be served only after Leaf2, although it has a higher priority (priority 7) than Leaf1 (priority 8). In case of equal priorities and equal states, HTB serves these classes, using round robin algorithm. Here are some examples on how the HTB works. Now let us describe some scenarios, using this HTB hierarchy. Imagine a situation when packets have arrived at Leaf1 and Leaf2. Because of this, Leaf1 attaches itself to this level's (Level 0) self slot with priority=8 and Leaf2 attaches to self slot with priority=7. Leaf3 has nothing to send, so it does nothing. 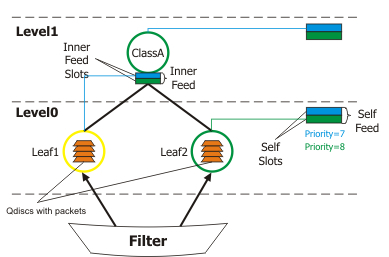 This is a simple situation: there are two active classes (Leaf1 and Leaf2) at Level 0, and as they both are in green state, they are processed in order of their priorities - at first, we serve Leaf2, then Leaf1. Now assume that Leaf2 has to send more than 256kbps, so it needs to go over it's green limit. With the state change, it attaches itself to its parent's (ClassB) inner feed, which recursively attaches itself to Level1 self slot at priority 7. Leaf1 remains in green state - it has packets to send, but their rate is lower than 1Mbps. Leaf3 still has nothing to send. It is very important to understand that Leaf1 now has higher effective priority than Leaf2 (when it is in green state), although we have configured it for a lower priority (8) than Leaf2. It is because Leaf2 has disconnected itself from self feed at Level 0 and is now borrowing rate from its parent (ClassB), which, in turn, has attached to a self feed at Level 1. Thus, the priority of Leaf2 has jumped to Level1. Remember that lowest level is served first, than the next level, and so on, satisfying the attached classes in order of their priority. Consider that Leaf1 has reached its max-limit and changed its state to red, and Leaf2 now uses more than 1Mbps (and less than 2Mbps), so its parent ClassB has to borrow from ClassA and becomes yellow. Leaf3 still has no packets to send. This scenario shows that Leaf1 has reached its max-limit and cannot even borrow from its parent (ClassA), so it is detached from all self slots and inner slots. Leaf2 has recursively reached Level 2, as it borrows from ClassB which, in turn, borrows from ClassA, as it does not have enough rate available. As Leaf3 has no packets to send, the only class that sends is Leaf2. In this situation Leaf2 is in yellow state, but it cannot borrow (as Class B cannot borrow from Class A) and Leaf3 is the only class that can send. Note that even though no other calsses, including its parents is able to send, Leaf3 can send perfectly well while is is attached to the Level 0 self feed. Finally, let's see what happens, if Leaf1, Leaf2, Leaf3 and ClassB are in the yellow state, and ClassA is green. 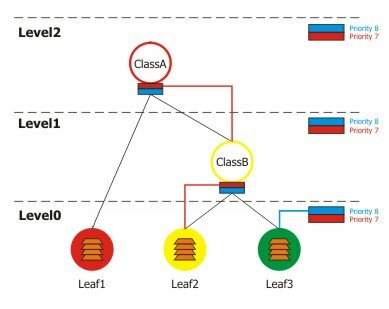 Leaf1 borrows from ClassA, Leaf2 and Leaf3 - from ClassB, and ClassB, in turn, borrows from ClassA. Now all the priorities have 'moved' to Level 2. So Leaf2 is on the highest priority and is served first. As Leaf1 and Leaf3 are of the same priority (8) on the same level (2), they are served using round robin algorithm. Bursts are used to allow higher data rates for a short period of time. Every 1/16 part of the burst-time, the router calculates the average data rate of each class over the last burst-time seconds. If this average data rate is less than burst-threshold, burst is enabled and the effective rate limit (transition to the red state) is set to burst-limit bps, otherwise the effective maximal limit falls to max-limit. At the beginning the average data rate over the past 8 seconds is 0bps because no traffic has passed through this ruke before it has been created. Since this average data rate is less than burst-threshold (192kbps), burst is allowed. After the first second, the average data rate is (0+0+0+0+0+0+0+512)/8=64kbps, which is less than burst-threshold. After the second second, average data rate is (0+0+0+0+0+0+512+512)/8=128kbps. After the third second comes the breakpoint when the average data rate becomes larger than burst-threshold. At this moment burst is disabled and the effective data rate limitation falls down to max-limit (256kbps). Note how the burst-time was used. The actual duration of burst does not depend of burst-time alone! It also depends on the burst-threshold/burst-limit ratio and the actual data rate passing through the bursty class. In this example the burst ratio was 192000/512000=3/8, the time was 8, and the queue has been trying to utilize all available rate the class was providing, so the burst was 3 seconds long. Now you can easily see why the burst-threshold should be between limit-at and max-limit for normal operation. 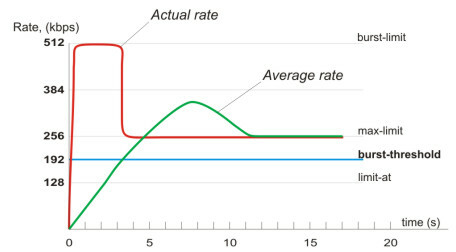 If you specify burst-threshold higher than max-limit, then the average rate will tend to burst-threshold, but the effective maximal limit will jump between max-limit and burst-limit constantly (depending on the actual traffic rate, it may happen even on each evaluation point (1/16th of burst-time)). When adding a simple queue, it creates 3 HTB classes (in global-in, global-total and global-out), but it does not add any classes in interface queue. Queue tree is more flexible - you can add it to any of these HTB's. These queuing disciplines are based on the FIFO algorithm (First-In First-Out). The difference between PFIFO and BFIFO is that one is measured in packets and the other one in bytes. There is only one parameter called pfifo-limit (or bfifo-limit in case of BFIFO) which defines how much data a FIFO queue can hold. Every packet that cannot be enqueued (if the queue is full), is dropped. Large queue sizes can increase latency, but utilize channel better. Use FIFO queuing disciplines if you have a noncongested link. Stochastic Fairness Queuing (SFQ) equalizes traffic flows (TCP sessions or UDP streams) when the link is completely full. The fairness of SFQ is ensured by hashing and round-robin algorithms. Hashing algorithm divides the session traffic over a limited number of subqueues. A traffic flow may be uniquely identified by a tuple (src-address, dst-address, src-port and dst-port), so these parameters are used by SFQ hashing algorithm to classify packets into subqueues. The whole SFQ queue can contain 128 packets and there are 1024 subqueues available for these packets. Each packet stored in a FIFO-like 128 packet buffer, belongs to a certain subqueue, determined by the hash function (a simple function of the tuple values with 10-bit output is used, hence the amount of subqueues is 1024). Stochastic nature of the queueing discipline is observed in that packets from an unpredictable number of flows may actually be classified in the same subqueue. After sfq-perturb seconds the hashing algorithm changes and divides the session traffic to other subqueues, so that no separate data flows will be associated with the same subqueue for a long time. The round-robin algorithm dequeues pcq-allot bytes from each subqueue in a turn. Use SFQ for congested links to ensure that connections do not starve. SFQ is especially benefitial on wireless links. To solve some SFQ imperfectness, Per Connection Queuing (PCQ) was created. It is the only classless queuing type in RouterOS that can do rate limitation. It is an improved version of SFQ without its stohastic nature. PCQ also creates subqueues, based on the pcq-classifier parameter. Each subqueue has a data rate limit of pcq-rate and size of pcq-limit packets. The total size of a PCQ queue cannot be greater than pcq-total-limit packets. The following example demonstrates the usage of PCQ with packets, classified by their source address. If you classify the packets by src-address then all packets with different source IP addresses will be grouped into different subqueues. Now you can do the limitation or equalization for each subqueue with the pcq-rate parameter. Perhaps, the most significant part is to decide to which interface should we attach this queue. If we will attach it to the Local interface, all traffic from the Public interface will be grouped by src-address (probably it's not what we want), but if we attach it to the Public interface, all traffic from our clients will be grouped by src-address - so we can easily limit or equalize upload for clients. Same can be done for downloads, but in that case dst-address classifier will be used, and PCQ put on the locan interface. To equalize rate among subqueues, classified by the pcq-classifier, set the pcq-rate to 0! PCQ can be used to dynamically equalize or shape traffic for multiple users, using little administration. In fact, PCQ always equalizes the subqueues, so the pcq-rate is just a cap for equalization - a subqueue may get smaller rate, but will never get higher rate. Random Early Detection (also known as Random Early Drop, as this is how it actually works) is a queuing mechanism which tries to avoid network congestion by controlling the average queue size. When the average queue size reaches red-min-threshold, RED starts to drop packets randomly with linearly increasing probability as the average queue size grows up until the average queue size reaches the red-max-threshold. The effective queue size at any moment could be higher than the red-max-threshold as the probability does not grow very fast, so it is possible to specify a hard limit for the queue size. When the average queue size reaches red-max-threshold or becomes larger, all further packats are dropped until the average queue size does not drop below this valus (at which point probalistic calculations will be activated again). The pb probability value is increasing linearly from 0% to 2% as the average queue size grows from red-min-threshold to red-max-threshold: pb=0.02*(avg-min)/(max-min). The packet dropping probability pb is increasing with pb and with enqueued packet count since the last packet was dropped: pa=pb/(1-count*pb). It is defined experimentally that a good red-burst value is (min+2*max)/3. And a good red-max-threshold is twice red-min-threshold. Note that in the formulas above, min means red-min-threshold, max means red-max-threshold and burst means red-burst. Used on congested links with high data rates, as it is fast and TCP-friendly. In order to send packets over an interface, they have to be enqueued in a queue even if you do not want to limit traffic at all. Here you can specify the queue type which will be used for transmitting data. Note that once you configure tree queues for a listed interface, the interface default queue is no longer active for that particular interface, so you need to make sure all packets that goes out through this interface are filtered into some qdiscs inside the HTB tree. Otherwise the packets that are not filtered, are sent out directly (at effective higher priority than any of the packets in the HTB tree), and unbuffered, which ultimately lead to suboptimal performance. 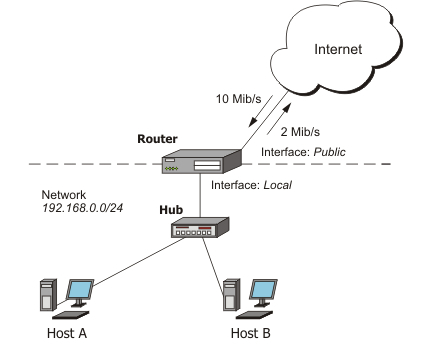 The simpliest way to limit data rate for specific IP addresses and/or subnets, is to use simple queues. The queue trees should be used when you want to use sophisticated data rate allocation based on protocols, ports, groups of IP addresses, etc. At first you have to mark packet flows with a mark under /ip firewall mangle and then use this mark as an identifier for packet flows in queue trees. To solve this situation, we will use simple queues. The max-limit parameter cuts down the maximum available bandwidth. From the clients' point of view, the value 65536/131072 means that they will get maximum of 131072bps for download and 65536bps for upload. The target-addresses parameter defines the target network (or networks, separated by a comma) to which the queue rule will be applied. In the previous example we dedicated 128Kib/s download and 64Kib/s upload traffic for the local network. In this example we will guarantee 256Kib/s download (128Kib/s for the server, 64Kib/s for the Workstation and also 64Kib/s for the Laptop) and 128Kib/s for upload (64/32/32Kib/s, respectivelly) for local network devices. Additionally, if there is spare bandwidth, share it among users equally. 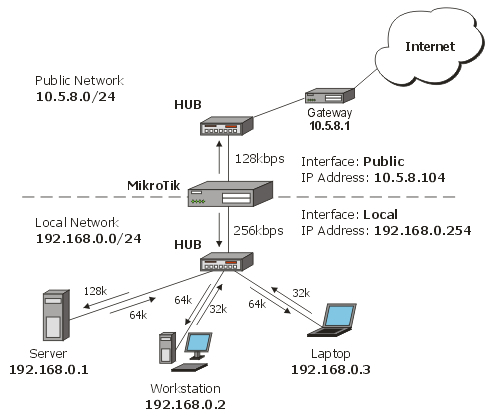 For example, if we turn off the laptop, share its 64Kib/s download and 32Kib/s upload to the Server and Workstation. When using masquerading, you have to mark the outgoing connection with new-connection-mark and take the mark-connection action. When it is done, you can mark all packets which belong to this connection with the new-packet-mark and use the mark-packet action. As you can see, we marked connections that belong for Laptop and Workstation with the same flow. 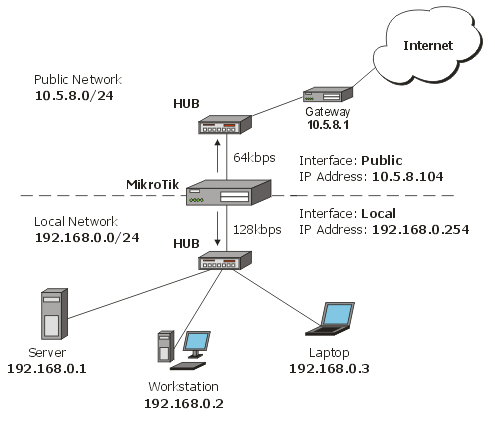 This example shows how to equally share 10Mibps download and 2Mbps upload among active users in the network 192.168.0.0/24. If Host A is downloading 2 Mbps, Host B gets 8 Mbps and vice versa. There might be situations when both hosts want to use maximum bandwidth (10 Mbps), then they will receive 5 Mbps each, the same goes for upload. This setup is also valid for more than 2 users. Now we will add 2 new PCQ types. The first, called pcq-download will group all traffic by destination address. As we will attach this queue type to the Local interface, it will create a dynamic queue for each destination address (user) which is downloading to the network 192.168.0.0/24. The second type, called pcq-upload will group the traffic by source address. We will attach this queue to the Public interface so it will make one dynamic queue for each user who is uploading to Internet from the local network 192.168.0.0/24. To view this article please follow the paypal link and help support our documentation section. This Document only costs €0 and is a once off payment for this document.